« Can the David of Swiss Human Rights Withstand the Goliath of IRS Extraterritorial Tax Enforcement? According to my reader poll, Michael Ramirez is the nation’s best political cartoonist. His new masterpiece about entitlements is a good example of his talent. In one image, he manages to convey how the system lures people into danger by offering the illusion that they can get something for nothing. 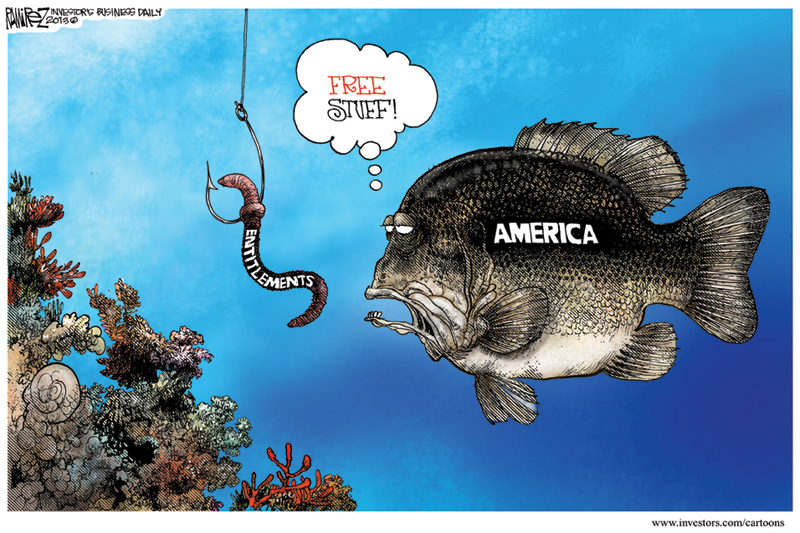 The cartoon is an apt illustration of where we are today with programs such as Food Stamps and disability, with ever-greater numbers of people being lured into lives of dependency. In other cases, though I’m afraid we’ve already passed the point of biting the hook, particularly for many of the middle-class entitlements. We’re now being reeled in and face a very real danger of being turned into euro-style fish filets. Though if I’m allowed to extend the metaphor, many people are working to reform Social Security, Medicare, and Medicaid in hopes of escaping the hook of dependency and fiscal crisis. 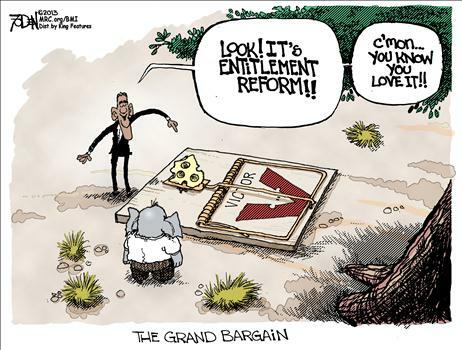 But it’s very important to realize that not all entitlement reform is created equal. As I explained back in 2011, the left would be more than happy to impose price controls and means testing as part of a “grand bargain” that seduces gullible Republicans into accepting a tax hike. Which is why this Glenn Foden cartoon hits the nail on the head. Sort of reminds me of this Ramirez cartoon. Simply stated, Republicans are dangerously susceptible to bad deals, which helps to explain why tax-increase budget agreements are always fiscal disasters. The moral of the story is that we need the right kind of entitlement reform, but that won’t be possible until at least 2017. P.S. If you want a tragically funny look at how the welfare state changes people for the worse, read the politically correct version of The Little Red. Private accounts would be far better for the economy [private saving verses government spending], but the prospect of solid gains are outweighed by the possibility [however small] of total loss. Therefore, some base guaranteed income is a necessary component to replace Social Security. Replacing Medicare is more difficult, since the promise of “you’ll live forever in comfort” is not dimmed by the reality that is Medicare. Since those on Medicare receive on average $14,000 in benefits, yet still need to buy “medigap” insurance, they could obviously do better on private plans. The even more tragic look is that while we have made only feeble, futile, and THEORETICAL attempts to entitlement reform, we have actually voted and enacted a third REAL entitlement behemoth called ObamaCare. That is the elephant in the room. Does anyone really think that ObamaCare will have a different political trajectory than Medicare and SS in terms of the support they enjoy? In a few years ObamaCare will morph into Medicare-for-all and will become as big, if not bigger, than Medicare. Once i retire young on ObamaCare, good luck folks withdrawing your near total subsidy. The farm animals just added another obligation to the Red Hen. She must now provide western level, developed world, cutting edge healthcare to all. The farm animals are absolved from having to earn their healthcare costs at some point in their lives. I think Red Hen will choose to stay in her nest with the little eggs she so much prefers warming and spending time with, rather than baking bread — and a little more secure and indolent in her new healthcare entitlement to boot. At which point, the farm animals will start starving and resort to slaughter for subsistence, or mandatory work where everyone shows up at work and does nothing more than third world level production. They all want unconditional first world communal services though! Sure as the principle of conservation of energy continues to hold, the dream will end badly. When you’re down and out of luck and motivation, sure is easy to hope that someone else will leave his family every morning to go work and outcompete three billion emerging world citizens, so that you can have first world standard of living on the job you chose out of preference and lack of skill rather than demand and utility. But that dream ends badly. No, not in one hundred years, but within your own lifetimes. The world is moving faster than ever and accelerating. Changes that used to take one hundred years will now conclude in a mere couple if decades. The Age of the Smorgasbord will be short. Enjoy while you can.